The Arbor Collection is perfect for creating an upscale look while providing a great value. 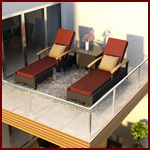 The Arbor Reclining Chaise Lounge is constructed with durable, thick-gauged aluminum frames, which are protected by a powder coating for superior corrosion resistance. The wicker is made of High-Density Polyethylene (HDPE), with its coffee bean color and UV resistance infused into the strands themselves. This creates a rich wicker color that holds up incredibly well with age. Its Grade A teak arms have been kiln-dried, removing excess moisture to ensure it will not crack or warp. Thick, comfy cushions are covered in fabric by Sunbrella®, the industry leader in mildew- and fade-resistant outdoor fabric.